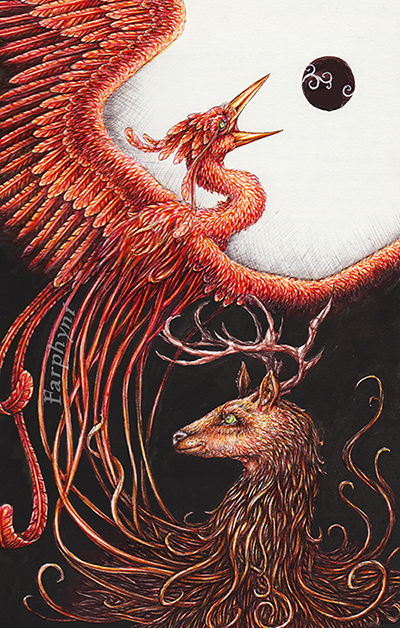 This started as quick pencil-sketch in the break between two study-lectures, and then got out of control and turned into a (with black ballpointpen) shaded work, but both creatures demanded colour – and so they got their colours und additional details. in the middle of the murky forest Braid pursues the true way. to the deep cliffs at the forest edge. and a pair of fiery wings carry Fenlon upwards. and the wide land is covered with the black coat. so that antlers grow at the head and feathers turn to brown fur.